The latest stats from ooba indicate that although house price growth has slowed, lower prices and easier access to credit is benefitting buyers. 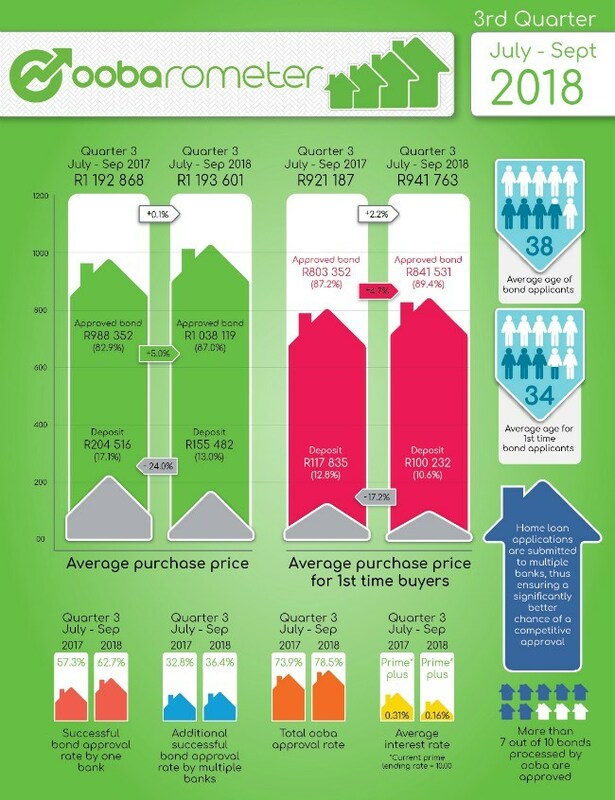 The Average Purchase Price recorded in Q3 17 was R1,192,868 against Q3 18’s R1,193,601. He says that banks are competing with each other by making loans more accessible and affordable, which signals their confidence in how consumers are managing their debt. This is illustrated in the significant increase of 4.6% in ooba’s Approval Ratio from 73.9% in Q3 17 to 78.5% in Q4 18. At the same time, the Average Approved Bond Size increased by 5% year-on-year and the Average Deposit as a Percentage of Purchase Price showed a significant decrease of 24% year-on-year. Buyers are also benefiting from the increasingly competitive interest rates from banks which are making home loans more affordable. ooba’s statistics for Q3 18 show that the average interest rate is 15 basis points cheaper year-on-year. The average rate that ooba achieved for its buyers in Q3 18 was 0.16% above prime compared to 0.31% above prime in Q3 17. In this buyers’ market, Dyer recommends that prospective home owners prepare and empower themselves by obtaining a home loan pre-qualification through ooba’s Bond Indicator (OBI) and Qualified Buyers Certificate (QBC) products. An OBI provides potential buyers with a clear online view of their credit score and credit profile, as well as a certificate outlining the house price range they can afford. The QBC increases the level of accuracy of the OBI, as the buyer’s information is checked and verified by an expert. “Pre-qualified buyers understand their spending power and can confidently negotiate a satisfactory house price knowing that getting bond finance is a mere formality,” concludes Dyer.